One of the significant difference between the LVDT (Linear variable differential transformer) and the RVDT (Rotatory Variable Differential Transformer) is that the LVDT changes the linear motion into the alternating electrical signals whereas the RVDT translate the angular displacement into an electrical signal. The other differences between the LVDT and RVDT are shown below in the comparison chart. Definition Converts the linear motions into electrical signals. Used for measuring the angular displacement. Sensitivity 2.4mv per volt per degree of rotation 2 to 3 mv per volt per degree of rotation. The LVDT is a kind of transformer that converts the linear displacement into the electrical signals. The transformer consists one primary and two secondary windings. Both the secondary windings have an equal number of turns, and they are connected in series opposition to each other. The primary winding is placed between the secondary windings. The primary winding is excited by the alternating current. The soft iron core is kept inside the former. The displacement which needs to be measured is linked to the soft iron core. The alternating current source use for exciting the primary winding. 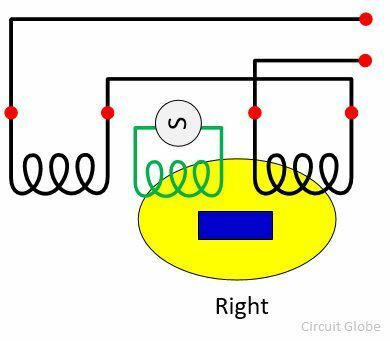 The current induces the flux in the primary winding and by the phenomenon of mutual induction this flux link with the secondary windings. 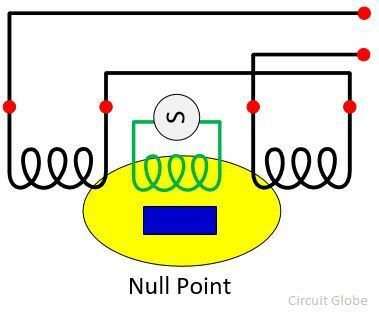 When the core is in the null position, the primary alternating flux links equally with both the primary and secondary winding. The equal magnitude of emf induces in the secondary windings. The output becomes zero at the null point. When the core shift towards left from the null point, in that case, the more flux link with the left secondary windings. When the iron core moved towards the right, the more flux link with the right side secondary winding. 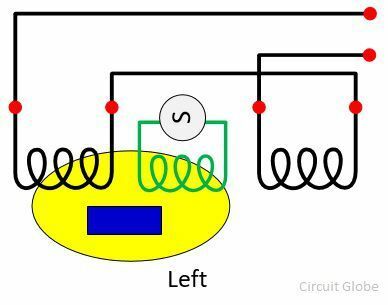 The output voltage of the secondary winding depends on the magnitude of flux linking with that winding. The variation in EMF in the secondary winding is proportional to the movement of the iron core. The rotary variable transducer senses the angular displacement. 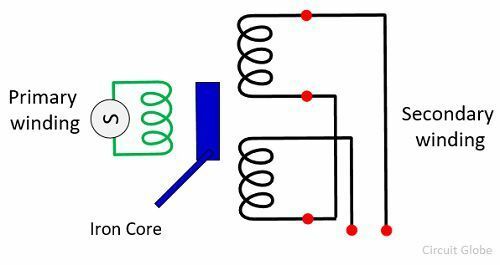 The core is placed between the primary and secondary winding of the transformer. The displacement which needs to be measured is linked with the shaft of the core. The LVDT converts the linear displacement into alternating current. And the RVDT converts the angular displacement into the alternating current. The LVDT stands for Linear variable displacement transformer while the RVDT stands for Rotatory variable displacement transformer. The core of the LVDT is rectangular, and the core of RVDT is the cam in shape. The LVDT measures the displacement in the range of ±100μm to ±25cm, and the RVDT measures the angular displacement up to ±40º. The LVDT has high sensitivity. It is approximately 2.4mv per volts per degree of rotation. Whereas, the sensitivity of the RVDT is in the range of 2 to 3mv per volt per degree of rotation. The input voltage range of LVDT is from 1V to 24V RMS, and the input voltage for RVDT lies up to 3V RMS. The LVDT measures the linear displacement, and the RVDT is used for measuring the angular displacement.